William Robert Wellesley Peel, 1st Earl Peel, GCSI, GBE, TD, PC (7 January 1867 – 28 September 1937), known as The Viscount Peel from 1912 to 1929, was a British politician. 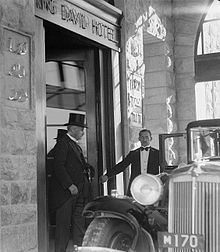 Lord Peel in the entrance of the King David Hotel, 1936. The eldest son of Arthur Wellesley Peel, 1st Viscount Peel and Adelaide Dugdale, Peel was born in London in 1867. His father was the fifth and youngest son of Prime Minister Sir Robert Peel. He was educated at Harrow and Balliol College, Oxford, where he was secretary of the Oxford Union. In 1893, he was called to the bar at the Inner Temple, and practised as a barrister before taking the position of special correspondent for the Daily Telegraph during the Greco-Turkish War of 1897. In 1900 Peel was appointed a member of the Royal Commission formed to inquire into the operation of the Port of London. In February the same year he began his political career when he was elected in a by-election to fill a vacant seat for Woolwich in the London County Council, to which he was re-elected in the ordinary election the following year. He was a member of the pro-Conservative grouping on the council that became the Municipal Reform Party. He was leader of the Party from 1908-10, and chairman of the county council from 1914-16. He begun his Parliamentary career when he was elected as Liberal Unionist MP for Manchester South at a by-election. At the next general election in 1906 he stood unsuccessfully at Harrow. He returned to the Commons in 1909, when elected as Conservative MP for Taunton at a by-election. He inherited his father's viscountcy in 1912, and moved to the House of Lords. Peel was appointed a Deputy lieutenant of Bedfordshire and lieutenant-colonel of the Bedfordshire Yeomanry in 1912, and on the outbreak of the First World War moved to France with his regiment. Due to ill health he returned to Britain in 1915. In 1918 he received his first government post as Joint Parliamentary Secretary at the Department of National Service. In 1919 he became Under-Secretary of State for War and a member of the Privy Council. Two years later he became Chancellor of the Duchy of Lancaster and Minister for Transport. He entered the cabinet in 1922 as Secretary of State for India as part of the coalition government of David Lloyd George but continued in the post after the downfall of the Coalition during the premierships of Bonar Law and Baldwin. Baldwin's Government fell in January 1924, but after a brief spell in opposition was returned to power at the 1924 General Election. Peel was appointed First Commissioner of Works in the Conservative administration formed by Stanley Baldwin. In 1928 he briefly returned to the India Office before the Conservatives lost power at 1929 general election. The latter year he was created Viscount Clanfield, of Clanfield in the County of Southampton, and Earl Peel in the Dissolution Honours. When a Conservative-dominated National Government was formed after the 1931 election he became Lord Privy Seal. He only held this office for two months, leaving government in November. In 1932 he was appointed chairman of the Wheat Commission, and in 1934 chaired the Royal Commission on the Common Law. In 1936–37, he chaired the Peel Commission which recommended for the first time the partition of the British Mandate of Palestine into separate Jewish and Arab states. Lord Peel married the Hon. Eleanor, daughter of James Williamson, 1st Baron Ashton, in 1899. They had two children: Arthur Peel, 2nd Earl Peel and Lady Doris, who married Col Stewart Blacker. In 1929, Lord Ashton died and Peel succeeded him as chairman of James Williamson and Company. He was a director of Barclays Bank and of the Great Northern Railway. Lord Peel died, aged 70, at his home in East Meon, near Petersfield, Hampshire in 1937 after a long illness. He was succeeded in his titles by his son, Arthur. ^ a b c d e f g h i j k Alex May (2004). "Peel, William Robert Wellesley, first Earl Peel (1867–1937)". Oxford Dictionary of National Biography. Oxford University Press. Retrieved 12 October 2008. ^ "London County Council election at Woolwich". The Times (36075). London. 26 February 1900. p. 7. ^ "No. 28638". The London Gazette. 23 August 1912. p. 6288.